Daniela Borrero ’21 (international studies, Italian) knew that she wanted to study foreign cultures and languages before stepping foot on campus, but once here, she truly fell in love with those subjects, and she's now planning an international career, perhaps with a government agency or NGO. Below, she discusses those plans, her experiences at an Italian-language summer camp and more. International studies and Italian studies, with a Russian minor. Newcomers to Neighbors, Russian Club, Spanish Club, Outing Club and Eco Reps.
Nise: The Heart of Madness. Originally, Dickinson was one of many in a pool of amazing schools that offered my intended major. In the end, the decision boiled down between a university in a big city and Dickinson. 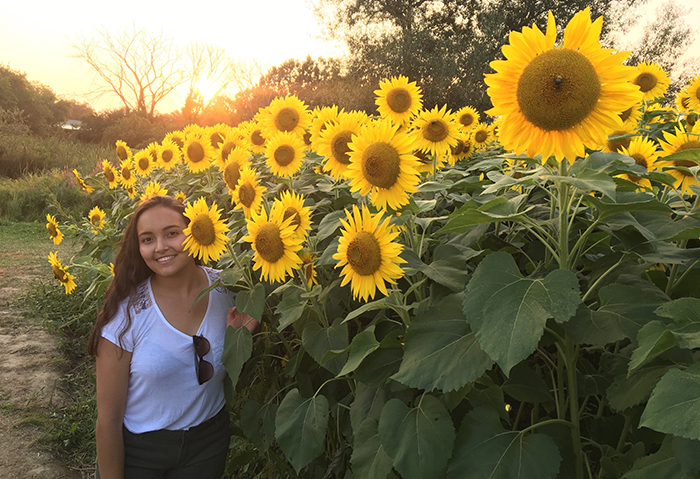 Knowing my study habits and goals for the future, I knew that I needed to go to a smaller school where I could easily focus, thrive academically and achieve my study abroad goals. Dickinson was the obvious choice. Breaded eggplant from the KOVE. I knew I wanted to major in international studies coming into Dickinson, but it wasn’t until I started taking Italian and Russian and met the amazing faculty that I fell in love with languages. As a result, I decided to commit to a lifetime of foreign-language education, starting with Russian and Italian at Dickinson. Since I would like to work internationally either in a government agency or NGO, I knew that my language education here would become an asset for the rest of my life and would allow me to communicate with people with whom I would otherwise not be able to connect. … a detective or a forensic psychologist. One of my favorite classes so far has been my First-Year Seminar, Learning Injustice: The School-to-Prison Pipeline. This class opened my eyes to the injustices embedded in our criminal justice system as well as the short-term and long-term implications of our own perceptions and actions. Although I am not an American studies major, I became increasingly interested in these types of issues as a result of this course, and I am now considering getting involved in policy writing. Last summer I worked at Lago Del Bosco, the Italian summer camp in Hackensack, Minnesota, as part of the Concordia Language Villages. It was different from any other job I had ever done before, and because I’d always wanted to have the summer camp experience and was interested in practicing my Italian, it was the perfect job for me. As I got used to the camp culture and working with children in an academic setting, I discovered the beauty of language education from a teaching perspective. Although I see myself working in an office setting in the future, this opportunity opened my eyes to the value of working one-on-one with individuals who are eager to learn more about a culture and language. Above all else, my ability to understand concepts from different perspectives and my patience improved significantly. The power of language. Although I come from a bilingual household, I never really understood the value of learning new languages until it became apparent that your native language is a part of your identity and culture and is your most natural form of expression. I’m dedicated to learning new languages because I realize that the best way to give people a voice is by enabling them to express themselves in a language in which they can best communicate. I am interested in applying for both a Fulbright research grant and to the Peace Corps. Eventually, I want to attend graduate school, either domestically or abroad. Down the road, I would like to work with an NGO that allows me to work directly with refugees, IDPs and/or asylees, as well as get involved with policy development.